Last updated 11 October 2018 . By Anisah Audu. If there’s one thing I can’t get enough of, it’s a banging meal with even better drinks. Why do you think I work here? Luckily for me, my friends all know this and when my bestie took me to Flesh & Buns for my birthday a few years ago, I was buzzing. Driven by Japanese cuisine, the original Covent Garden restaurant is an Izakaya pub-style venue; with moody interiors, a rock-fuelled soundtrack and a cheeky anime-filled bathroom. When the meaty eatery launched a sister site in Fitzrovia, I had to check it out. The team behind Bone Daddies have stepped their interiors game up to another level. Thought the Covent Garden venue was cool? Well, Flesh & Buns have stepped it up a notch in the transition to W1. I was glad I’d rocked up in heels and a nice top, because we weren’t in Kansas anymore. The décor is super swanky, with plush booths, oaky furnishings and lashings of gold. 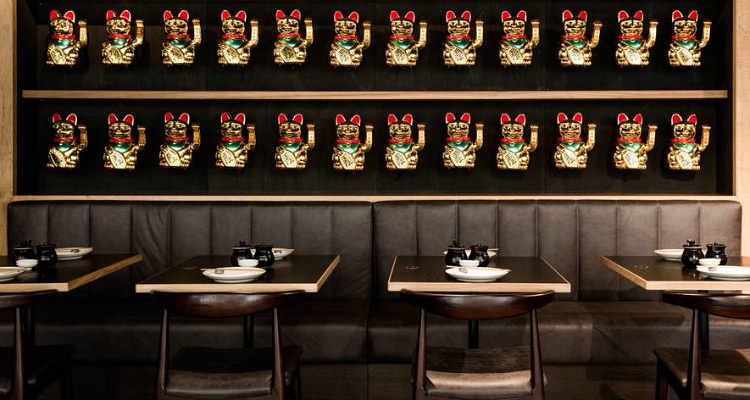 There’s even a wall lined with gilded fortune cats. It doesn’t end there though… each table has a ‘press for pisco’ button and before I’d had a chance to open a menu, the other half had his finger on the trigger. A cocktail trolley arrived and we watched a classic Peruvian (£10) and Green Apple Pisco Sour (£10) infused with shiso apple shrub shaken up at our table. The perfect punchy accompaniments for chips and dips (£6.40), first impressions were already ticking every box. Whether it’s meat or fish you’re after, it’s all mouth-wateringly good. Literally. Lobster ceviche (£16) was sweet and sour, yet soft and crunchy all at the same time. Korean fried chicken wings (£7.40) came drenched in a spicy sour sauce with sesame seeds. I’m getting hungry just thinking about ‘em. Press for pisco? You don't have to tell us twice. In a city where restaurants are opening and closing like a revolving door, you have to bring something worthwhile to the table. 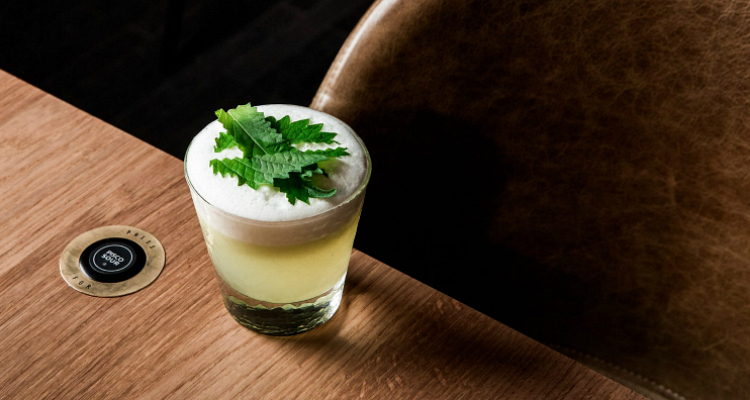 Blurring the lines between Japanese and Peruvian food, Nikkei cuisine is killing it here. There’s tonnes of tasty tiradito and a beautiful softshell crab sushi roll (£9.40) packed with chives, yamagobo, crispy sweet potato and rocoto mayo, while the Sumo Martini (£9.50) was an unusual combination of vodka, gokai, sake, umeshu and yuzu shu. Gearing up for the main event, a bottle of Mio sparkling sake (£16) was the perfect bubbly refresher to cut through the meaty flesh that we were about to devour. With a name like Flesh & Buns, we had high hopes for DIY bao buns that we were about to prepare. Wagyu rump steak (£28) was juicy and tender, served with Korean steak sauce and cucumber pickle, while shichimi and sansho pepper jerked duck (£19) arrived with a tangy coal-roasted peach chutney and super spicy pickled jalapeños. 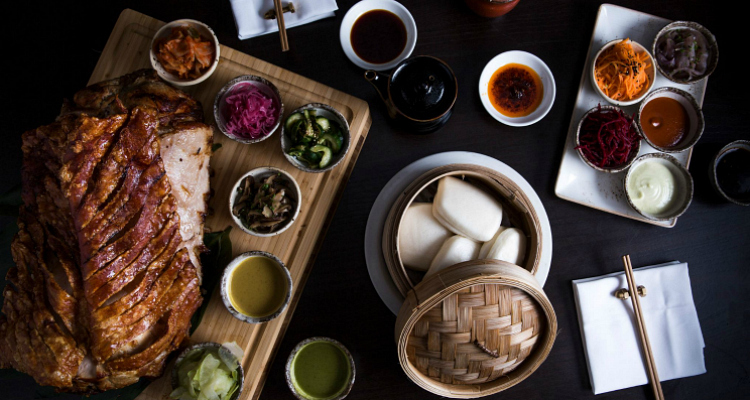 A feast for all the senses at this Fitzrovia spot. Ending on a high, I went for the signature s’mores (£8) that had won me over the first time around. A spectacle in their design, a fiery pit arrived, with passionfruit marshmallows to roast, before topping with almond chocolate and sandwiching between graham crackers. If that wasn’t enough, then the Coffee Shogun (£11) which combines coffee-infused shochu with maple syrup, double cream and vanilla bitters was the perfect accompaniment to wash it all down. The Dark Knight, Terminator 2, The Bourne Supremacy – why am I listing action movies? Well, here’s proof that sequels can easily smash the original out of the park, and that’s exactly what Flesh & Buns is doing in Fitzrovia. From the first cocktail, to the meaty buns, right through to dessert, there’s a show-stopper at every corner. Think of this latest opening as the older sibling; a sister site with mature vibes and sexier interiors, still smashing out an eclectic ensemble of dishes with side of fun.